Arthur J Pais reports from New York on a memorial service for Rabbi Gavriel Holtzberg and his wife Rivika who were killed in Mumbai on 26/11. The fathers of Rabbi Gavriel Holtzberg and his wife Rivika -- the caretakers of the Chabad House in Mumbai who were killed in the terror attacks a year ago -- led a procession in New York recently. Thousands of fellow Jews gathered for the Chabad-Lubavitch movement which was held at the Lubavitch world headquarters in the Crown Heights section of Brooklyn, New York, in memory of the couple's first yahrtzeit (death anniversary). Emotions ran high at the Chabad-Lubavitch house as the congregation watched Rabbis Shimon Rosenberg and Nachman Holtzberg, Rivka and Gavriel's fathers, fill in the last letters of the Torah scroll, a sacred scroll with inscriptions of great significance. Creating a new copy of Torah scroll is an elaborate process, he explained. "Each letter has to be written according to the tradition, and if any one letter is not written in the right way, the Torah is not valid." "Work on the inscriptions for the new Torah, which will replace the one that had been harmed during the siege, has been going on several months," he added. Rabbi Moshe Kotlarsky, vice-chairman of the Merkos L'Inyonei Chinuch, Chabad-Lubavitch's educational arm, said attendees of the movement filled in over 600,000 letters that comprise the Torah scroll. An inscription on the Torah's cover dedicates the holy scroll to the memory of the Holtzbergs and the four other Jews who died in the terror siege, Rabbi Seligson said. "When the terrorists stormed Chabad House, they weren't just looking to harm one centre," Rabbi Kotlarsky pointed out. "They were fuelled by an intense hatred for all Jews," he said. "We can't say that a year has gone by and it doesn't hurt. But that they didn't succeed, that we can say!" he added. As they have been doing for nearly a year, Jewish parents continued to name their newborn babies after Gavirel and Rivka in over 25 countries including Guatemala, Nepal, Israel, America, Canada and Italy. At least 500 children today carry the name of the couple slain in Mumbai. "The appeal went to people of all faiths or those who had no religious faith," Rabbi Seligson said, speaking from the Chabad House in Brooklyn where the Jewish movement asked 4,000 rabbis from across the world to commemorate the first anniversary of the death of Jews during the Mumbai attacks among other things. A Web site www.chabad.org/Mumbai called on people across the world to dedicate good deeds in the name of the slain couple and others, who were killed in the terrorist attacks. "While it is the government's task to respond militarily to the terrorists, on a spiritual level we respond to these acts of evil and darkness with light. For a little light dispels much darkness," Rabbi Seligson added. Image: Rabbi Moshe Klein assists others in writing letters on a new Torah scroll that will replace the damaged one ruined by the terrorists at Nariman House. Surely many also remembered Sandra Samuel, the Catholic caretaker who risked her life to save the Holtzberg baby, Moshe. 'Sandra Samuel is a true heroine,' she added. The Web site www.chabad.org also promotes a mitzvah campaign, asking visitors to perform a good deed in the memory of those who died in the terror attacks. Nearly 13,000 people have signed on to the campaign launched soon after the Mumbai carnage. One of the first people to respond to the request wrote that he had started treating his co-workers and subordinates with more respect and kindness. In Connecticut Governor M Jodi Rell has declared a 'Day of Goodness' in the state and urged residents to do good deeds in memory of the Holtzbergs. Many recent Jewish converts have taken on the names of the rabbi and his wife. The Chabad Web site notes that the day before the terrorists invaded Mumbai's Chabad House, Rivka Holtzberg was talking to a friend, Chani Lifshitz, co-director of the Chabad-Lubavitch in Kathmandu, Nepal. Chani was pregnant at the time, and Rivka assured her that she would come to Nepal to celebrate the birth of her child and help take care of the newborn, the Web site notes. 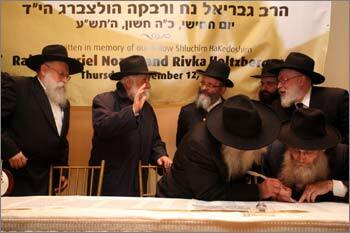 Image: From left, Rivka Holtzberg's father, Shimon Rosenberg; third from left, Gavriel Holtzberg's father, Nachman Holtzberg. 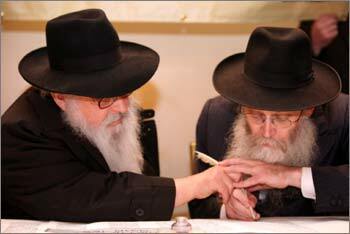 Image: Rabbis Shimon Rosenberg and Nachman Holtzberg.